The Mushroom Kingdom Hospital is the location where Dr. Mario takes place. The Viruses spread throughout the hospital after an experiment by Dr. Mario and Nurse Toadstool went awry, leaving Dr. Mario to fix the mess. 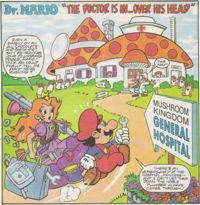 The hospital is actually seen in full in the Nintendo Comics System story "The Doctor Is In... Over His Head", where it is named the Mushroom Kingdom General Hospital. Dr. Waldo Bloom works there, although by the end of the story, he takes up golf and has Mario take his position. In addition to Mushroomland folks, enemy characters are also treated at the hospital, but are made to sign a contract to be good before they leave (though it sometimes fails). ↑ "Now, believe it or not, I work in the virus research lab at the Mushroom Kingdom Hospital." Dr. Mario game manual for NES, page 3. ↑ "One of the experiments has gone out of control. The viruses are spreading quickly!" Dr. Mario game manual for NES, page 3. This page was last edited on September 10, 2018, at 11:42.